In large bowl, toss beef with salt and pepper. Spray 6-quart Instant Pot™ insert with cooking spray. Select SAUTE; adjust to normal. Add oil to insert. Add beef in 2 batches; cook 2 to 4 minutes on first side until browned. Turn, and cook 2 to 4 minutes longer on second side or until browned; transfer to medium bowl. Add onions, mushrooms and bacon to insert; cook 4 to 5 minutes, stirring occasionally, until onions start to soften. Bacon may not be fully cooked. Select CANCEL. Add broth, wine, tomato paste and beef to insert. Add carrots and celery on top of beef. Secure lid; set pressure valve to SEALING. Select MANUAL; cook on high pressure 45 minutes. Select CANCEL. Set pressure valve to VENTING to quick-release pressure. 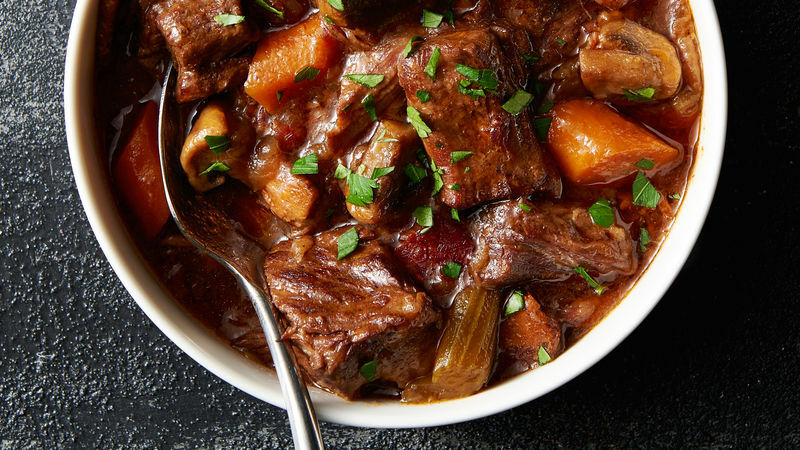 You can substitute 2 lb beef stew meat to save prep time.